The best way to prevent anxiety—and the stress-induced bellyache that comes along with it—may be to balance your gut bacteria. 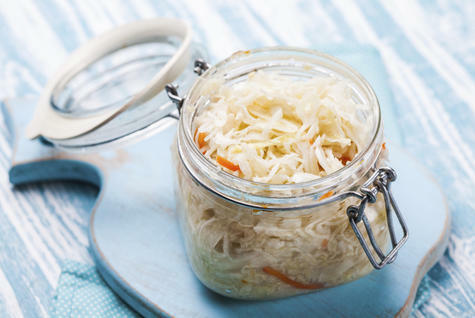 Eating probiotic-rich fermented foods is associated with less social anxiety, according to a new study published in Psychiatry Research. Plus, this held true even for individuals who may be genetically predisposed for anxiety. The researchers explained that phobias seem to be hereditary, suggesting a genetic component. They measured this with the personality trait of neuroticism (a personality trait characterized by instability, aggression, and anxiety). In the study, individuals who rated high for neuroticism had fewer social anxiety symptoms if they at more fermented foods. One way your gut talks to your brain is through the hypothalmic-pituitary-adrenal axis (HPA). "As far as gut-brain communication is concerned, your HPA axis is an interstate freeway," says Gerard Mullin, MD, author of The Gut Balance Revolution. • The hypothalamus is part of your brain. • The pituitary gland controls several hormones. • Your adrenal system governs your body's stress response. How does your gut get involved? Dr. Mullin points out that initial research with rats has found that a healthy microbiota early in life is critical for their HPA development. "If this turns out to be true of humans as well, we'll know that your microbiota have a far wider influence over your health than we originally thought," he says. And we do know that an imbalanced HPA axis can lead to an exaggerated stress response and altered neurotransmitters and brain hormones. "This may be one of the reasons why mood disorders such as depression and anxiety and even autism have been tied to [microbial imbalance] and why administering probiotics helps improve these conditions," he says. Related - Stressful Relationships Related To Mental Decline. In addition to eating probiotic foods—like kefir, sauerkraut, fermented miso, and kimchi—Dr. Mullin recommends eating non-digestible carbs (aka fiber) to support good gut bacteria. His picks are bananas, onions, Jerusalem artichokes, asparagus, and leeks. "This class of fiber is so important because your gut bugs love to eat these fiber-rich and fermentable carbs, and when they get them, they send out 'happy' messages encouraging your body to produce these chemicals in the right amounts," he says. While this study doesn't prove a causational link between fermented foods and social anxiety, it does add to the research supporting that a healthy brain starts in the gut because of the gut-brain axis.